LAKE BUENA VISTA, Fla. (AP) — Dhamir Cosby-Roundtree had 15 points and 13 rebounds as defending national champion Villanova stopped a two-game skid by beating Canisius 83-56 on Thursday in the opening round of the AdvoCare Invitational at Disney World. Phil Booth also scored 15 points for the Wildcats (3-2), who will play the winner of Memphis-Oklahoma State in the semifinals on Friday. Villanova went from No. 8 to out of the AP Top 25 after losing to Michigan 73-46 in a rematch of last season’s championship game and losing 76-68 in overtime to Furman last week. Villanova’s Mikal Bridges, Jalen Brunson, Donte DiVincenzo and Omari Spellman were all taken in the NBA draft after last year’s championship run. Canisius (1-3) got 19 points from Isaiah Reese. Takal Molson, who entered averaging 21.3 points, had 10. 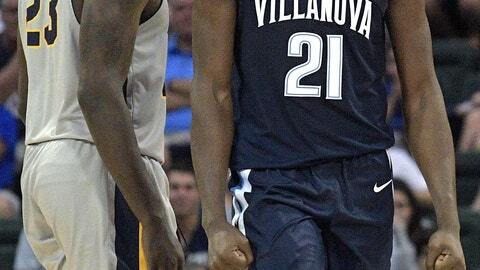 The Golden Griffins got to within 63-52 with 4½ minutes left before Villanova pulled away.